Safety Lamarcus Joyner opted to join the Oakland Raiders defense this offseason by signing a four-year, $42 million contract with $21.3 million in guarantees. This comes after spending five productive seasons with the Rams, and the 2018 season under the franchise tag in the Los Angeles secondary. 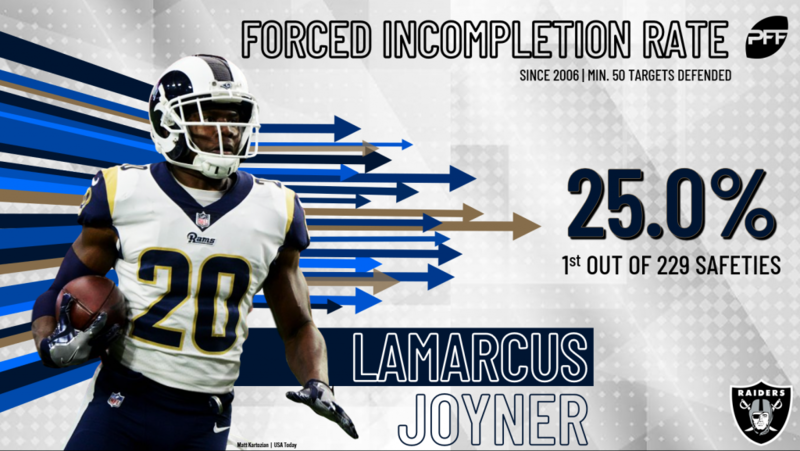 Joyner has been a vital part of the Rams’ defense throughout his five NFL seasons, but he really made an impact over the past two campaigns. After posting a 90.9 overall grade in 2017, he fell off a bit in 2018 with a 73.1 mark. That was due in part to a less active season in coverage, where he failed to notch five pass breakups for the first time in three years. However, his ability was still on full display, as he didn’t allow a completion of more than 19 yards during the regular season, and he missed just five tackles on 1,100 defensive snaps including the playoffs. The Florida State product has provided versatility with skillsets to lay the wood despite his 5-foot-8, 190-pound frame and line up in coverage against tight ends and receivers in the slot. Though, it’s Joyner’s high-level talent defending the pass that has been his calling card throughout the first leg of his career. In 2017, Joyner ranked third among all safeties with a 91.2 grade in coverage, while allowing a remarkably low 27.4 passer rating that ranked first at the position. He also forced a pass breakup or interception on 38.5% of his targets in coverage, best among all secondary defenders. Over his career, Joyner has forced an incompletion — by way of either close coverage, a pass breakup, or an interception — on 25.0 percent of his targets in coverage, which is the best rate among the 229 safeties with at least 50 targets since 2006. Digging deeper from seasons 2014 to 2018, Joyner has produced a 72.7 grade when covering the slot, 20th among all defensive backs, and he has allowed a passer rating of 89.4 which is the second-best mark among qualifying safeties. Along with Joyner’s 25.0 percent forced incompletion rate, he’s also produced a 12.9 percent forced incompletion rate when defending the slot, by far the best among safeties since 2006. Already among the best in coverage, Joyner is also one of the soundest tackling safeties in the NFL. Over the past two seasons, he’s only recorded nine misses on 156 tackle attempts, and he ranks fourth among qualifying safeties in that span in missed tackle percentage. After a dominant 2017 campaign, Joyner took a slight step back this past season. Still, he’s a missile on the back end who has the ability to transform the Raiders’ secondary that produced a dismal 55.0 coverage grade as a unit last season, second-worst in the NFL. If Joyner can get back to his 2017 level of play, the Oakland defense will see an unquestionable improvement in Jon Gruden’s second season at the helm.